Philip Hamburger is the Maurice and Hilda Friedman Professor of Law at Columbia Law School. 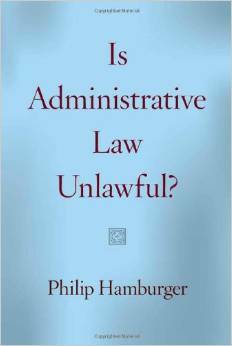 He is a distinguished scholar of legal history and the author, most recently, of Is Administrative Law Unlawful? Professor Hamburger gave us his take on the book here. My take is that it is the most important book I have read in a long time. Professor Hamburger argues that administrative law is unlawful, unconstitutional and illegitimate. Drawing on English legal history, he contends that the regime of agency government resurrects the prerogative power once claimed by English kings and places it in the executive branch of the United States government. The history makes clear that this is exactly what our Constitution was carefully designed to prevent. Given that federal regulations promulgated by administrative agencies now dwarf the statutes passed by Congress, attention must be paid. Thus far, administrative law has avoided much rancor because its burdens have been felt mostly by corporations. Increasingly, however, administrative law has extended its reach to individuals. The entire society therefore now has opportunities to feel its hard edge. As a result, like seventeenth century English kings who took their prerogative beyond what the public could bear, the administrative state is moving in a direction that is apt to provoke more resentment than obedience. In a republic, it is not too much to expect that law will be made by a legislature composed of representatives of the people. It is, in fact, the very nature of a republic to be governed by laws made by this sort of specialized legislative body. Nonetheless, administrative legislation is unrepresentative. It therefore is without consent, without obligation and without popular accountability. Indeed, it is a form of class power, without a regular means [of] aligning itself [with] popular sentiment. None of this bodes well, but it is exactly what might be expected when a people no longer merely govern themselves, but are forced to comply with the commands of unelected administrators. The history of government is largely a story of elite power and popular subservience. Americans, however, turned this old model upside down. By establishing a republican form of government, they eventually made themselves masters and made their lawmakers their servants. More than two centuries later, the shell of this republican experiment remains. Within it, however, another government has arisen, in which new masters once again assert themselves, issuing commands as if they were members of a ruling class and as if the people were merely their servants. Self-government thus has given way to a system of submission.